In UD's novel Standardized Patients Program, nursing student Elizabeth Morris and physical therapy student Jerry Choi attend to a "patient" played by theatre student Zachary Jackson. When Amy Cowperthwait finished nursing school, she found herself half-wishing she could be hospitalized so that she would know what it was like to be a patient. 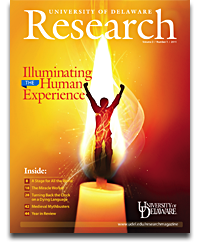 Twenty years later, Cowperthwait, who is now resource simulation center coordinator in the University of Delaware School of Nursing, found a less extreme way to give her students that empathy-developing experience. UD's Standardized Patient Program (UDSP), a collaboration between the College of Health Sciences and the Department of Theatre, is a unique way to prepare students for their roles as health care profes-sionals. With this approach, individuals are trained to portray patients and family members so that students can practice such skills as taking medical histories and doing physical exams. UD's distinctive twist on the traditional standardized patient concept is that the actors are not professionals — they're undergraduate theatre minors. 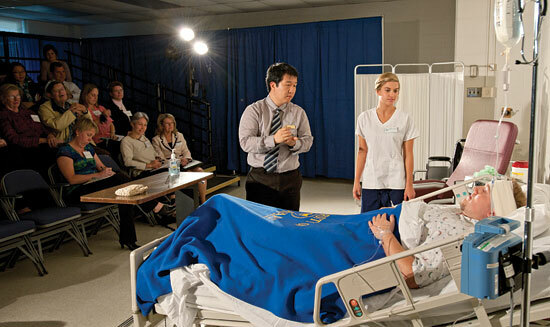 The resulting scenarios develop in a very dynamic way, with the health sciences and theatre students interacting with each other and providing feedback in an unscripted give-and-take. "We believe that UD is the only school in the country taking this approach," says Allan Carlsen, undergraduate adviser and coordinator in the theatre department. "A few other institutions are using graduate theatre students as standardized patients, but our theatre minors are critical to the approach we're taking and the results we're seeing." The connection with the theatre department includes not only students but also theatre directors to help train the actors and provide them with ongoing feedback throughout their "performances." "Our 180 theatre minors, who represent the full range of majors at UD, make up a tremendous pool of talent for us to tap into," Carlsen says. "All of these students, regardless of the career path they follow, will need good communication skills, and this program offers them a great opportunity to develop those skills." "Better communication is key to better health care," says Kathleen Matt, dean of the College of Health Sciences. "The quality of our health care is directly connected to how we present ourselves to medical professionals. That's why this program is so valuable not only to the health sciences students but to the theatre minors as well — they're learning how to be better patients." Allan Carlsen, undergraduate adviser and coordinator in the theatre department. Matt points out that the program also offers a critical opportunity for the students to learn how to work together. While the program has so far included just nursing and physical therapy students from the health sciences side, plans are to phase in other disciplines, including athletic training, medical technology, exercise science and nutrition. "The next generation of health care professionals and leaders will be required to work in teams," Matt says. "Our standardized patients program provides that experience, with the patient as an integral partner." The addition of family members further complicates the dynamic and enhances the realism of the scenarios. "In a pediatric case, for example, you might have not only a child in pain but also one parent who is hysterical while the other has completely shut down," Cowperthwait says. "Our nursing students are much better prepared for the clinical experience in their senior year if they've already dealt with situations like this through the standardized patients program." 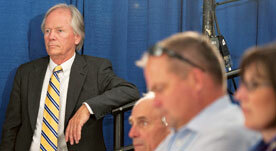 According to Cowperthwait, one important new direction for the program is patient safety. She cites hand washing as an example. "Nurses tend to be very diligent about this," she says, "but sometimes doctors are not. At the same time, a nurse may be intimidated about confronting a physician who has overlooked this basic precaution. Going through a scenario can teach nurses about the best way to handle a situation like this and empower them to actually do it in a clinical setting." Carlsen agrees: "With the standardized patient approach, there's no cost when a grievous error occurs. But there's something visceral about live. The lesson sticks." The UD team has also contributed to the development of a set of interactive videos to teach communication skills to health care professionals across the country. Produced and marketed by the F.A. Davis Company in Philadelphia, the videos were filmed on the UD campus, with theatre minors playing roles in more than 20 scenes. The scripts were written by Cynthia Diefenbeck, who has a doctorate in clinical psychology and is a member of the UD nursing faculty, and Kyle Phillips, who holds degrees in both theatre and nursing. Although Phillips' cross-training might seem unusual, faculty are starting to see overlapping interests in the students who are involved in the UDSP. "Some of our theatre minors have switched to the nursing major after parti-cipating," Carlsen says, "and we've also seen students choose the theatre minor based on the opportunity it offers to join the program." Bethany Callaway planned to earn a degree in health behavior science and then enter an accelerated nursing program. Her plans changed after she participated in the UDSP, and she is now a junior in UD's traditional undergraduate nursing program. Never having been seriously injured or hospitalized, she found her eyes opened to the effect nurses have on their patients. 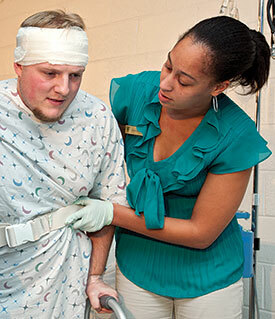 Jazmine Tooles, a doctoral student in physical therapy, works with her "patient," theatre student Zachary Jackson. He is portraying the victim of a car accident. "Their empathy, voice and even touch or lack of it affected how I responded to them and how I felt," she says. "I was able to tell when the nursing students wanted to be there or whether they really cared about me as a 'patient.' I think patients deserve the best care, and it's not just by way of machines, medicines or needles, but also by way of empathy." Based on growing interest in the subject, the team recently developed an interdisciplinary elective course, Healthcare Communication. Open to all undergraduates, the course incorporates film, text, observation, improvisation and experiential learning to prepare students for their roles in various health care settings. UD's clinical partners have recently become interested in the Standardized Patients Program as well. Nemours/A.I. duPont Hospital for Children is planning to implement the approach in training first-year pediatric emergency fellows, and Christiana Care Health System is applying it with third- and fourth-year medical residents. "Standardized patients will provide our clinicians with unique educational interventions and allow for direct feedback that will enhance interpersonal and communication skills," says Dr. Maria Diaz of the Division of Emergency Medicine at Ne­mours/A.I. duPont Hospital for Children. At Christiana Care, Dr. Tabassum Salam has been involved in the education of physicians-in-training and medical students for over 10 years. "I am very excited to have a novel modality with which to teach them communication skills and the art of working in multidisciplinary teams," he says. "The simulated scenarios will make the clinical cases feel very real for the learners, and they will get to practice skills that just cannot be taught in a traditional classroom format." 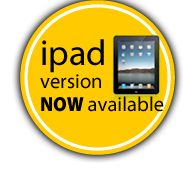 The program is still so new that little data has been collected at this point. However, evaluations indicate that the approach is "eye opening" and "revolutionary." "I think the UDSP exemplifies the transformative experience that we believe our students should have at the University of Delaware," Carlsen says. The standardized patients program taught me invaluable lessons that I don't believe I could have learned anywhere else. Being a patient in a "hospital room" with all its equipment gave a very realistic sense to the experience. Perhaps most important is that I will always remember how it felt to be a patient. In medicine, the patient's mood and willingness to cooperate can lead to better diagnosis and treatment. Since we had many nursing and physical therapy students rotate throughout the day, I got to experience many different ways of treatment. Even as an actor and not a real patient, I still felt the difference within me when a nurse, for example, held my hand and asked me how I was doing. I felt like a human being and someone that was cared for. So I made a decision to spend more time with people who I may one day give care to, so that I can help them to heal with not only medicine but also compassion and love. I have long been interested in the mind-body connection, so I am taking a year off after graduation to travel, to gain a better understanding of people and a better sense of cultural differences. I want to open my eyes to the variation within the world. Editor's Note: Sepehr Sedigh Haghighat graduated from the University of Delaware earlier this year, with a degree in biology and a minor in theatre.